A recent trip to Copenhagen provided us with enough color inspiration to last until spring! 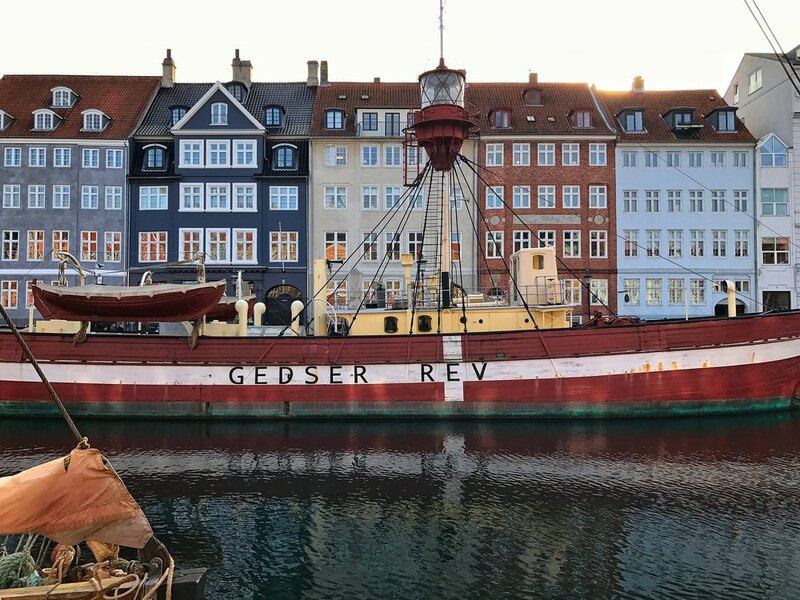 Copenhagen is a city full of effortlessly-cool beauty, which can be seen in the architecture, interiors and in the fashion of its inhabitants. This effortlessly-cool approach extends into Danish interiors, in part thanks to a very controlled and measured application of color: subdued neutrals, layers of tone on tone colors, various shades of grey, and the occasional pop of a bold accent color. Below, we share some of our favorites moments, along with some tips on how to inject these successful color strategies into your space. HUE: Another word for color. For instance, the hue in the photos above is yellow. CHROMA: Think of chroma as saturation. It is a word used to describe the intensity of a color. VALUE: A term that describes the lightness (tint) or darkness (shade) of a color. This photo, taken at the Norman Copenhagen flagship showroom, reflects a trend that we saw throughout the city: spreading one hue across various objects in a space. This technique is really powerful when used correctly, and provides a three dimensional experience of one color (as seen in all of the Norman Copenhagen interior images shown above). In the photo on the left, the upholstery on the furniture is the same hue as the color on the wall. 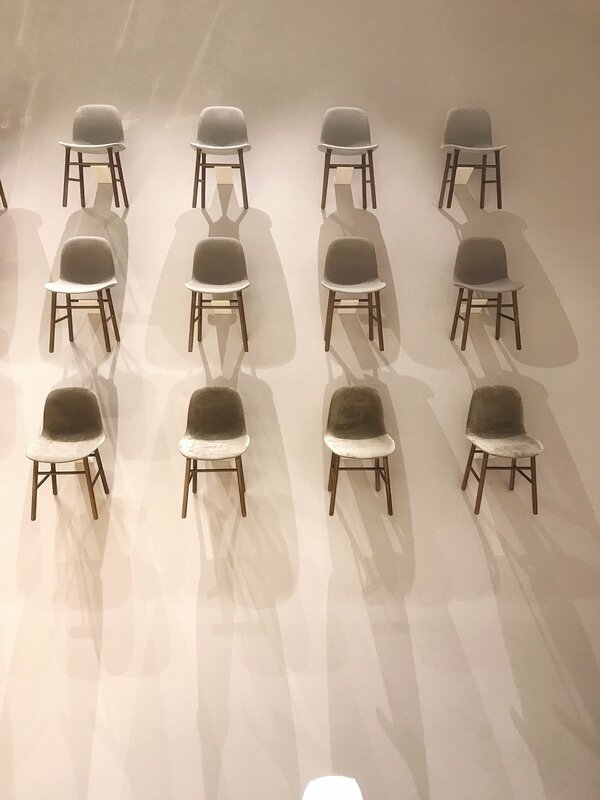 Each row of chairs uses a different material and is a different value of the same color-- the darkest being the bottom row of chairs, and the lightest being the top row. Although simple, the diversity in materials and color value keeps things interesting. Wait there's more: texture, texture and more texture! There is essentially no such thing as too much texture in a monochromatic space. 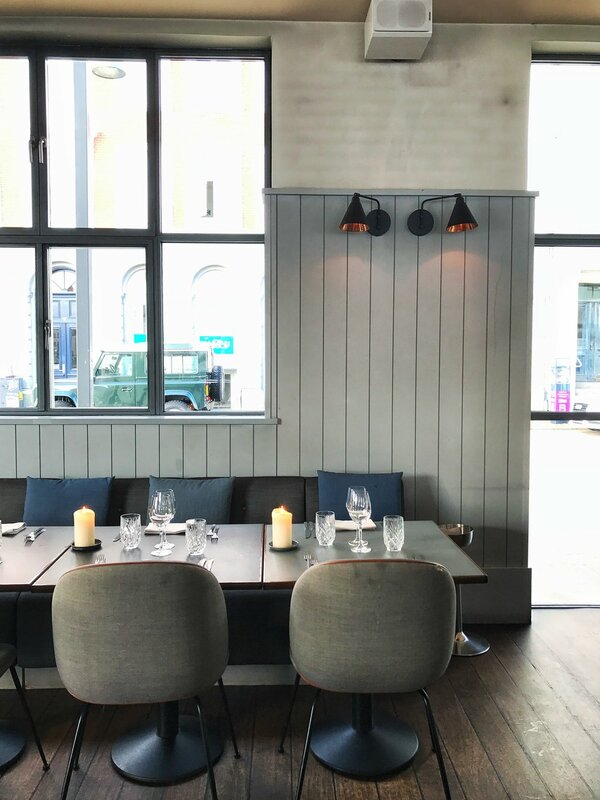 This photo, taken at The Standard Copenhagen, shows one color, grey, on three different surfaces (rug, sofa, wall), each with its own sensory profile. The back wall also has grey undertones, completing the monochromatic nook. Every material has unique properties and will react differently to light, meaning that the same color will look different across a variety of materials, and this my friends, leads to anything but a boring space! Double the impact of one hue by adding a reflective material, special lighting, or mirrors. 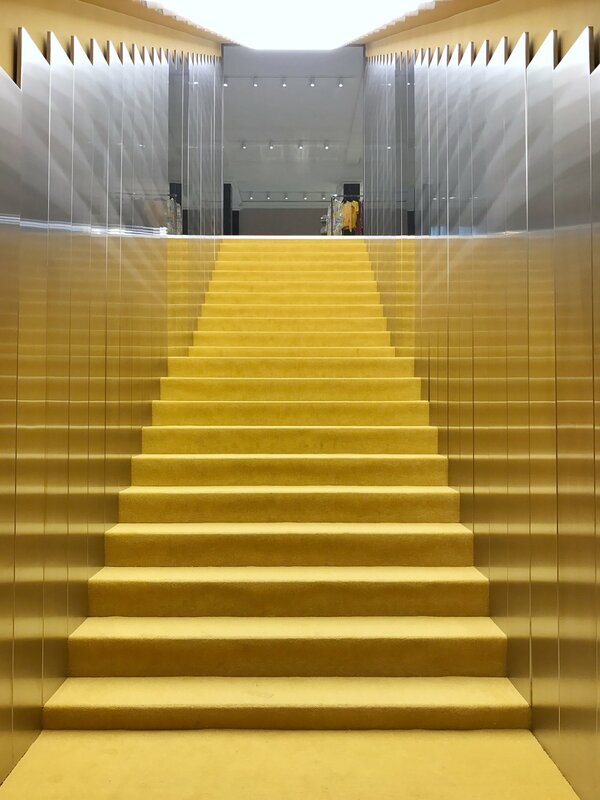 In this image of the iconic stairway in the Norman Copenhagen store, the only gold color is in the carpet and painted on the ceiling. It feels like there is a lot more gold than this, and that's because the mirrors on either side of the stairs infinitely expand the reach of the gold hue. 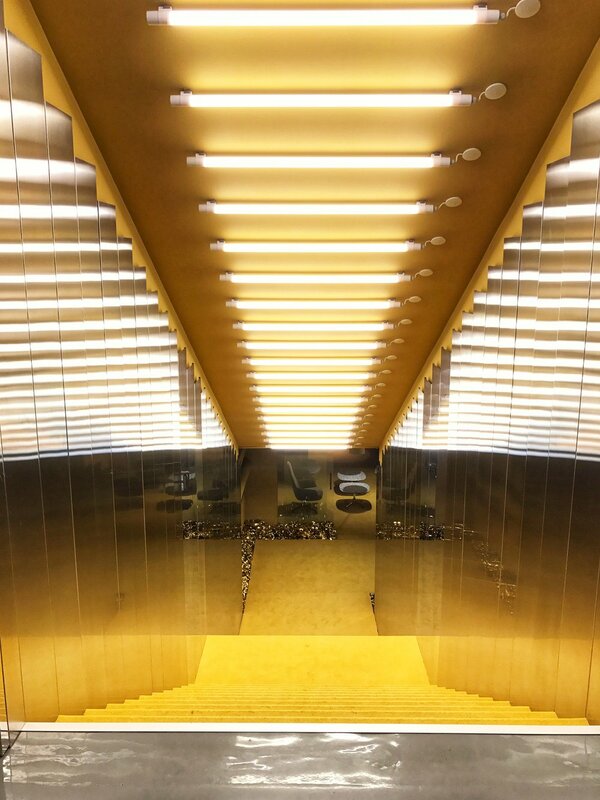 The lighting on the ceiling casts a warm gold glow, and is also reflected in the mirrors, as well as the reflective floor surface at the top of the stairs. A little bling goes a long way! If you like the idea of a restrained color palette, but aren’t ready to commit to a fully monochrome space, consider going mostly monochrome, but with a few noteworthy exceptions. You can throw in some bold pops of a contrasting color to liven up your sophisticated, mostly monochromatic space. We saw a lot of grey-green interiors with pops of pink (green & pink for the win-- always! ), and loved the way the Norman Copenhagen store broke up the intense gold scheme with jewel tones and terrazzo. This is just the tip of the iceberg, and color is a very complicated subject. If you're someone who likes the idea of inserting more color into your space, but aren't sure what colors look good together, or you just want to learn more about the subject, we recommend you start with an old-fashioned color wheel. This inexpensive, tried and tested tool is something that we have on hand at all times. It's one thing to buy a color wheel, but another thing to effectively implement those colors into your space. We can help! Contact us about color consulting. That's all folks. Time to get colorful! Please note that we use our own images whenever possible. In the instances when we use an external image we always credit the source. If you see an image that is not properly credited please let us know. We want to make sure that all images are properly credited. On that note, we encourage you to use our images as much as you want, just please be respectful and credit Lorla Studio when you do. Thank you!